Start at zero, and go to hero! Buckle up and get ready to fly as Storm Show’s 2016 ski/ride/adrenaline film takes to the skies! Start at zero, and go to hero! Buckle up and get ready to fly as Storm Show’s 2016 ski/ride/adrenaline film takes to the skies! Jackson Hole’s premiere skiers and riders are sending it bigger than ever before off massive cliffs and neck-deep powder. Highlights include rocket-biker Xan Grayson riding 80mph wheelies through the streets of downtown Jackson, Jeff Leger hucking his meat without a parachute off of 100 foot cliffs, and Jessica McMillan skiing the deepest powder in Wyoming. Zero 2 Hero will melt your face off with mind-blowing non-stop action and a killer custom soundtrack to match! 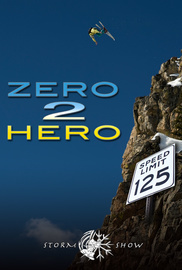 Get your ski flick fix with Storm Show’s Zero 2 Hero!